Though ‘round the girdled Earth they roam, Her spell on them remains. This is part of the Dartmouth anthem. CAFOB just left our house for another liaison with same “unavailable” guy (I have the name, phone number and address now, phew). I kept opening the door while she waited for the elevator to make sure she had money for a cab if she felt she needed to come back tonight, to make sure she knew where she was going and to make sure she knew her “friend” would take care of her. And finally before I closed the door for the last time, I made sure she would tell him I knew where to find him and that he should be afraid, very afraid. I don’t care if we are all nearing 50. Adults are simply children in expensive clothes. So, I worry. Sue me. CAFOB, I’ll be waiting up until morning when you come back. No guilt. No pressure. We nine friends have sustained each other through ups and downs in our lives. One of the Nine, CAFOB (California friend of blogger) is staying with us for a few days. Another of the Nine, NYFOB (New York City friend of blogger) emailed about what CAFOB was up to. I emailed back that CAFOB was staying downtown some place that night. NYFOB emails back: YOU MEAN YOU DON’T KNOW WHETHER SHE IS SEEING THAT CRAZY GUY? OMG! NOOOOOO DETAILS??? NYFOB was soooo right: I failed in my obligation to question her comings and goings with the detail and precision (and techniques) of a seasoned New York detective. There are some rules we Nine live by: “you do it, you live with it” and “if you want to dance, you pay the fiddler” (both courtesy of the now much-mellowed DCFOB (DC friend of blogger). In other words, CAFOB had a responsibility to spill her guts and break all confidences about the — hmmm — liaison. And it was my responsibility to enforce the rules. Utter and total failure. I am sensing a group visit and intervention being planned. Luckily, POB (partner of blogger) was available and got the whole story. POB says to CAFOB, “You have a choice: you tell the Nine or I will tell the Nine. Choose wisely.” Sad things can wait; juicy gossip among us must be revealed with great dispatch. I love that POB enforces the laws of the Nine if I am not around. POB is a true life partner. Thirty YEAHS (said like a New Yorker). It isn’t as if we were celebrating 30 years of marriage or a career. We were celebrating surviving for 30 years since we last saw each other as a group. “So, whatcha been doin’?” would require days, if not weeks, with every classmate, in order to catch up. But we only had a few hours. I was the class nerd whose parents couldn’t afford to have me keep up with the clothes and accessories of the others. So, I always felt I was on the outside looking in and, sometimes, some of the girls were mean. And, of course, I had an inkling that I was different somehow (later, to realize I was gay). I think it manifested by not understanding how to connect to the other girls; I was always at home talking with the guys. Except I hurt my arm 10 days ago and hadn’t been to the gym. And, POB (partner of blogger) is no longer employed. Just make sure the make-up is flawless and the lipstick color is awesome. So I put on comfy clothes and went. There was a small pre-party at a classmate’s chocolate shop, with people who were always quirky and kind enough to accept my bizarro-ness and eccentricities even then. Immediately upon entering the chocolate shop, all trepidation disappeared. And the years melted away in such a warm and wonderful way. [Just a side bar about the chocolate shop: Bond Street Chocolate, www.bondstchocolate.com, a tiny, fabulous place that is worth the schlep to East 4th Street; it isn’t actually on Bond Street]. We all arrived at the official party. The turn out was amazing. And, again, people were instantly recognizable. Life has tread on all of us. We lost our harder edges. The mean girls weren’t mean anymore. Those old distinctions didn’t matter anymore. We all had happy times, disappointing times, scary times, and sad times and that makes us all a lot more grounded than teenagers spending grades 7-12 together in a tiny Upper East Side private school. I left grateful for the occasion to reconnect with people who share some of my past and, I hope, part of my future. Just last night over dinner out, POB (partner of blogger) and I were discussing our different approaches in dealing with annoying people or circumstances. POB is from a “good home”, has wonderful manners and rarely curses. Even though I , too, came from a “good home”, I have a potty mouth. The practical difference is that POB can be baited for a long time before she boils over. Someone has to dangle that fish hook at her for a good, long while. In contra-distinction, I will drive to some barely noticeable bait, put in the water by a sleepy fisherman and impale myself on the hook, squirm and cuss. Who knew that our theoretical conversation would almost immediately have practical application. Our son’s teacher sent around an email that all the kids need to bring 2-litre clear bottles for a science experiment. Because POB is a class mom (and so am I, by extension), we decided to get some extra ones in case some of the kids’ parents did not receive the email blast. 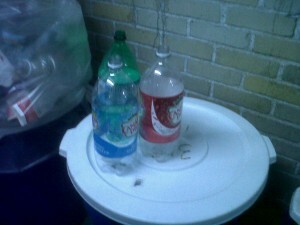 Thinking, “reduce, re-use, recycle,” we went to the basement of our building to get used soda bottles. It was an event so I had to document it (pictures are a little unclear; darn that blackberry camera). Last night late, POB sent around an email suggesting that the recycling in everyone’s apartment buildings’ basements would be a good place to look for this particular “school supply”. Just keeping with the “reduce, re-use, recycle” mantra. 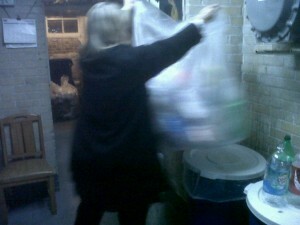 Ok, AS IF any of us rummage through our building garbage as part of our daily regimen? So, I had to, had to, had to email back (hitting reply to all, of course), that it was foreign for us, too, so much so that I took pictures to document the event. Tonight was curriculum night at our son’s school. The teachers tell the parents about what the kids are learning and the year’s goals. As if I know whether it makes any sense or is grade-appropriate. Nevertheless, I go because, well, you know the adage, “be there or be talked about”. In fact, POB (partner of blogger) and I did talk about those who weren’t there over dinner later. Let’s face it, we are all just children with graying hair. So, if you put us in a gossip-y environment, then you better run for cover. We were at the school for two hours, during which I slipped into the slouching, smart-mouthed, bored student of my youth. I was disruptive during the reading teacher’s presentation because I was joking back and forth across the table with another mother (who has made a cameo in prior blogs — the mother of our son’s future wife). Later, I was whispering to the father of my son’s best guy friend (who also has made a cameo in prior blogs — he was the one in need of adult male bonding rituals after months at home with the kids). During the math teacher’s presentation, I was getting antsy and was counting ceiling tiles. During the art and music presentation, which was last, I stared at the clock until there were ten minutes remaining and then I started packing up. Just the kind of child that makes teachers leave teaching. POB took notes throughout and asked pertinent questions. She elicited smiles and positive reinforcement from the teachers. She was like that as a kid. Remember we’ve known each other since we were ten years old and I know that she always did her Hebrew school homework. Her Hebrew school homework, for G-d’s sake (in a manner of speaking). If there is a test on the details at the next parent teacher conference, POB will ace it and won’t let me peek at her paper. I just know it. My poor son. I sure hope nature (POB’s genes) beats nurture (my overbearing personality) because otherwise he is toast. So we have been torturing our son with our rendition of the parents’ back-to-school jig made famous on last year’s Staples commercials. Our son is alternatively amused, and a bit peeved, at his parents’ dancing around like we’ve won the lottery. After much lobbying, we agreed reluctantly to buy our son Lunchables for the first day of school only. Lunchables is some chemical and saline combo-fest that passes as food per the FDA. There is a special place in hell for parents who feed Lunchables to their kids. Of course, the mushballs that we are, we also ate dinner out and let our son have french fries since it was — after all — the night before school FINALLY starts. He did have a grass-fed beef burger at least. POB (partner of blogger) swears we are just going to put a salt lick in our son’s room to satisfy his salt lust; we are not sure how to deal with the grease lust. Seriously, he would give us up in a New York minute if someone guaranteed him french fries every day for life. No contest. It is the middle of September and he is just now going back to school. Now I understand it when my parents used to say — sarcastically, I assure you — that they paid private school tuition so we could have more vacation than at public school. In 1971, when SOB (sister of blogger) started at a private school in Manhattan (where nearly all the students were Jewish), my dad had to go to school and speak to the headmaster to make sure that a teacher had to postpone a test scheduled for Yom Kippur. Even in 1981 at our little private school, Jewish students were excused from class on the High Holy Days but school was open. Now, schools in Manhattan give off the major Jewish holidays, as a matter of course. A lot has happened in 30 years. Maybe next year, the kids will have off for the festival end of Ramadan. It is only fair. So, because POB (partner of blogger) reminds me that in “good homes” the carpets and the furniture are cleaned annually, and the windows are cleaned twice, before Passover and before Rosh Ha-Shanah, we have been in a cleaning frenzy. Also the mice episodes gave the cleaning rituals a bit more fevered pitch this year. Also the bed bug scare in New York had us getting new mattresses, etc. In short, we are doing what we can to raise the retail sales numbers nationally. Now, that is patriotism. Our housekeeper comes on Fridays. Our housekeeper is a wonderful and robust woman in her 60s who comes from Poland and, as she says, “knows hard vork”. But since she is in her 60s we try to get others to the hard vork. In this case, POB and I wanted to lay the cleaned rug down in the dining room (we had already done the heavy lifting in the living room). This endeavor also involved cutting the mat underneath so that the rug laid properly. Here are the many dramas that came into play: Our housekeeper said, “[Blogger], you are educated; I know hard vork. Step avay from the mat and I vill cut!” Ok, POB and I were raised to respect our elders and never to let someone older do work we could do ourselves. We are also the “employers”, adding another level. Also, POB is strong like you-can’t-imagine strong. So we are all on the floor playing out our social, economic and cultural dynamics. The window cleaner walks in (we had left the door open for him after the doorman announced him) and sees three woman on the floor with scissors and box cutters arguing over who is cutting the mat that goes under the rug. He asks, “where do I start?” Really? Really? Is this a usual scene for the window cleaner? We all stop. I agree to cede the fight to POB and our housekeeper in order to get the window cleaner guy started as long as I get to move the dining room table. Pause. I seeing nodding and I retreat. A little victory of sorts. Back in my head, I am thinking you thought we should get our windows cleaned before a hurricane. This is not like wearing good underwear in case you are taken to an emergency room. The hurricane won’t treat us any better. But then the hurricane passes us and POB is right — again. All of the talk of Hurricane Earl has my son asking about other types of natural disasters. His questions are very specific: why are there earthquakes in California and not in New York City (where we live)?? I didn’t want to tell him that earthquakes are possible in New York and we have had tremors before. He is only 8 years-old after all and that could freak him out. Well, all right then. I actually thought I was doing a good job answering the question, way better than my answering of the Tampax question. Apparently, I failed to give him new information even though I was essentially making up the connection between earthquakes and plate tectonics. I knew there would come a time when my son knew more about stuff than I did. I didn’t realize that it would happen when he is EIGHT YEARS OLD!!!!! But don’t tell him that earthquakes can happen in New York City; he is still a little boy and might really get scared.